When tenants hashtag #amazeballs to a picture of their landlord, they’re thinking of George Woolsey. For the uninitiated, I’ll give you a quick recap of the situation involving Vancouver’s best property owner. George Woolsey is a former Downtown Eastside landlord who has refused to pay thousands of dollars owed to tenants, and who has been the target of a years long legal campaign against him by a B.C. law society representing said tenants. He used to own Wonder Rooms SRO (single room occupancy) and the Palace Hotels SRO. Residents of his properties finally had enough of his antics, and filed a group action against him with the LTB. During a February 2011 building inspection of the properties, Vancouver city inspectors discovered 165 deficiencies, including a dead-bolted emergency exit, unsafe stairwells, missing or broken smoke alarms, damaged walls, floors and ceilings, and clear evidence of bedbug, cockroach and rat infestations, according to a report that was presented to city council. To boot – the bottom floor of the hotel, a vacant commercial storefront, was essentially a gigantic rat infestation that would have made Crispin Glover’s skin crawl. Council also heard allegations that Wolsey, a former pharmacist, was still involved in the distribution of methadone and that he evicted people from his properties if they failed to obtain their methadone from him. Lastly – council also heard from tenants that he would regularly intimidate them, made substantial efforts to prevent them from speaking to city inspectors about anything and everything, and paid residents well below minimum wage and under the table for simple jobs like renovations and cleaning up rooms after residents moved out or died. You know…the simple jobs. The Residential Tenancy Branch ruled that Woolsey owed $18,163.75 to 10 different tenants for infestations and health and safety risks. What did Woolsey do? He gave a proverbial middle finger to everyone, refused to pay the amount, skipped a bunch of court dates and requirements to show up, and returned to the Death Star. Since Woolsey technically sold the buildings in 2012 (while facing an injunction from the city and foreclosure from his bank), he figured it wasn’t his problem anymore. 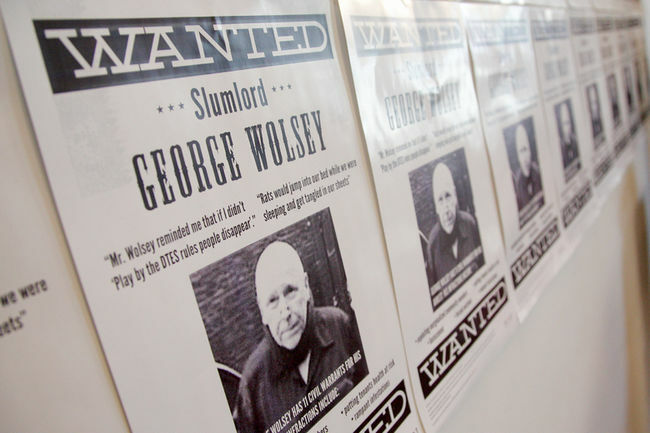 Pivot Legal Society announced last week that it had secured 10 arrest warrants as part of a three-year battle to get Wolsey to pay the money he was ordered to, proceeded to make a whack load of old style Western “wanted” posters, and put them up all over the city. Apparently, that was enough to get him to come down from Mount Doom and resurface, which he did a few days ago. Pivot prepped a backgrounder on the whole situation which you can find here. It’s fascinating – really. It’s guys like this who give good landlords a bad name. What do you think?